Rinse rice and soak in cold water for 30 minutes. While rice is soaking, toss butternut with 2 Tbs. oil, pinch of salt and 1/2 tsp. of spice mixture. Transfer to parchment-lined sheet pan and roast until tender. Set aside. Drain rice; transfer to large sauce pot with stock, 1 cup of the coconut milk, 1 tsp. salt, turmeric and remaining spice mixture; place over high heat and bring to boil. Cook for 5 minutes; remove from heat and set aside. Heat large skillet over medium-high heat; add remaining Tbs. of olive oil. Stir in garlic, ginger and poblano; saute until fragrant, about 15 seconds. Stir in onion and pinch of salt; saute until golden brown, about 8 minutes. Deglaze with chardonnay, scraping up all the browned tasty bits from bottom of pan. Transfer to pot with rice; stir together, check seasoning and set aside. Butter medium casserole dish. Pour in half of the rice/onion mixture, top with half the roasted butternut, and drizzle in half the remaining coconut milk. Repeat process layering remaining rice, squash and coconut milk. Sprinkle with salt and cover with aluminum foil. Bake for 20 minutes, or until cooked through and liquid is mostly absorbed. Remove from oven and let stand, covered, for 5 minutes. Remove foil, squeeze juice from 2 or 3 of the lime wedges over the top and check seasoning. 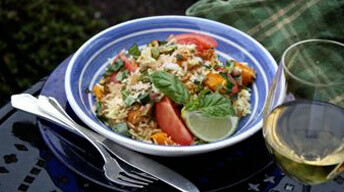 Garnish with pistachios, toasted coconut, tomato wedges, remaining lime and cilantro.